OK people, you don't need me to tell you how incredible Wicked is. The 2004 multiple Tony winner is currently the 9th longest running musical on Broadway (closing in on #8 pretty quickly), and I'm not even going to try to guess how many millions of people have seen it or how many billions of dollars it has grossed. It's a smash hit blockbuster by all accounts, but one that deserves every ounce of its success. No matter how many time I've seen it (six, if you're counting), it never fails to thrill and enchant me with it's larger than life set and costumes, endlessly singable score, and most of all, its beautiful message of friendship and standing up for what's right. 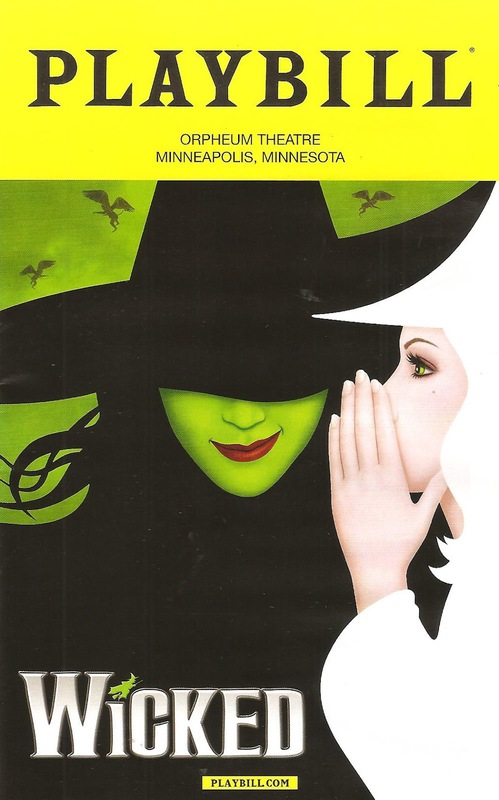 So I'm not going to describe the show to you (I've done that twice before, here and here), or tell why you should see it while it's in Minneapolis for a month, I'll just note a few things that struck me about seeing this particular production of the phenomenon known as Wicked at this particular time. This cast is phenomenal, with perhaps one of the best Elphaba performances I've seen. Jessica Vosk is funny and awkward and strong, with unique vocal phrasing that makes these iconic songs sound fresh and new. Ginna Claire Mason is also wonderful as Glinda, all bubbly perkiness that belies her hidden depth, and the two believably portray the driving love story of Wicked - Elphie and Glinda's enduring friendship. Other highlights in the fantastic cast (that is, however, disappointingly non-diverse for a show about seeing past the exterior and fighting against discrimination) include Isabel Keating as the harsh Madam Morrible, a deceptively charming Fred Applegate as the Wizard, and Jeremy Woodard as Fiyero, with charisma to spare. I couldn't help imaging how amazing it would be to see a local production of Wicked, if and when the rights become available for regional productions. I'd love to see a different take on the look of the show (however fabulous it is), with a local cast that looks something like this, as one suggestion: Kate Beahen as Elphaba, Shinah Brashears as Glinda, David L. Murray Jr. as Fiyero, Gary Briggle as the Wizard, Greta Oglesby as Madame Morrible, directed by Peter Rothstein of course. How fun would that be? Or what if Ten Thousand Things did a totally stripped down small-cast production? The possibilities are endless. "The best way to bring folks together is to give them a really good enemy." "Celebrated heads of state... did they have brains or knowledge? Don't make me laugh, they were popular!" "The truth isn't a thing of fact or reason, it's simply what people agree on." Somehow this story of women who are "sick of playing by the rules of someone else's game," fed up with a thoughtless bumbling ruler who continues to take away more and more people's rights and voices, feels really right and important right now. If you agree, you might want to head on down to the beautiful and historic Orpheum Theatre between now May 14. Click here for ticket information, and click here to find out about the daily $25 lottery.